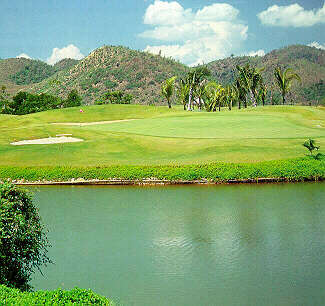 Thailand, and especially Hua Hin, are not well known around the world for their golf courses though they should be. There is great golf to be played here, in addition to the many activities available to the non-golfers in the family. Courses are well maintained and service is excellent. Green fees at most courses are about $75. Caddies are required at most courses and are about $9 with an additional $4-8 tip, depending on their experience and help during your 18 holes. At those courses where available, electric carts are about $20 which usually includes a caddy. Caddies in Thailand are usually female and often quite adept at reading greens and determining yardage. They are not hired for their English ability however so speak slowly and listen attentively and you’ll both do fine. Clubs are often available for about $15 and shoes an additional $2. Some courses are now offering Sports Days or Afternoon Fees where fee are reduced to around $35 after 1400 or 1500. Also, the local Golf Societies get reduced rates for their weekly matches and welcome guests. The Hua Hin Golf Society meets regularly at Berny’s Inn in the Hua Hin Bazaar. The aristocrat of golf courses in Thailand, the Royal Hua Hin Golf Course was designed in 1924 by Scottish railway engineer, A.O. Robins. While perhaps not possessing the skills of Jack Nicklaus’ team, Robins’ creation has impressed golfers from all over the world for decades. As one local English expat says, “This is like an English country course. If it wasn’t for the temperature, you could be playing in England”. With an area of over 180 acres, the RHHGC sits at the base of the Khao Hin Lek Fai hill, just across the tracks from the Hua Hin Railway station. As you walk the course, you’re afforded views of the hills, temples, and the sea, and some very good golf–with not a water hazard to be seen! Only a 5 minute walk from the beach with the most natural surroundings of any course in the country, complete with resident monkeys, this is truly the course in Thailand for any visitor to try. Designed by Phil Ryan. Opened in April 2007, Black Mountain has astounded onlookers with its quality and speed of construction. The aim of the designer was to create a golf course that looks as natural as possible and maintains many of the features of the site. The most important features are the natural creeks that run throughout the course and the natural rocks that have been used as design features on many of the holes. As many of the original trees as possible have been kept and many new trees have been planted to frame the holes. Very important in the design concept, was to create a course that could be a test for the top golfers in the world but also very playable and enjoyable to the average golfer. Overlooking the stunning views of the Black Mountain ranges and the masterfully crafted links of the course, The Black Mountain Golf Club’s clubhouse is an ultra modern example of pure luxury and convenience that will make the choosiest golfer prune with excitement at the end of each round, no matter how well or badly they played. Designed by Pirapon Namatra, Banyan Golf Club has beautiful views of the Gulf of Thailand from the hills just south of town. The teak clubhouse has a fully stocked pro shop and changing facilities and a restaurant overlooking the 9th and 18th greens. The club’s signature hole is the par 3, 15, with a dramatic sea view and a sleeping lion island. Completed in 2010, The Sea Pine Golf Course is the newest course in Hua Hin. Located about 9km south of Hua Hin on the Suan Son Pradiphat Military Camp, this course and the camp were built to provide recreation facilities for the Thai Army. The beach is long and clean and there are bungalows for rent. The course is also open to the public but military personnel have priority. Located on the beach, this course offers great challenges on the six holes along the beach. Divided by the railway line, small hills on the west side of the tracks provide some relief from the winds. The sea views from the course are quite remarkable and the clubhouse takes advantage of this and also serves up good Thai food. Tee off times should be much easier to confirm on weekdays rather than weekends. This site is ideal for families as should the wife and kids not play golf, they can chill at the long, clean beach while Dad enjoys a round of golf. There are beach chairs, umbrellas, and inner tubes available for rent at the beach and a restaurant for Thai food and drinks. 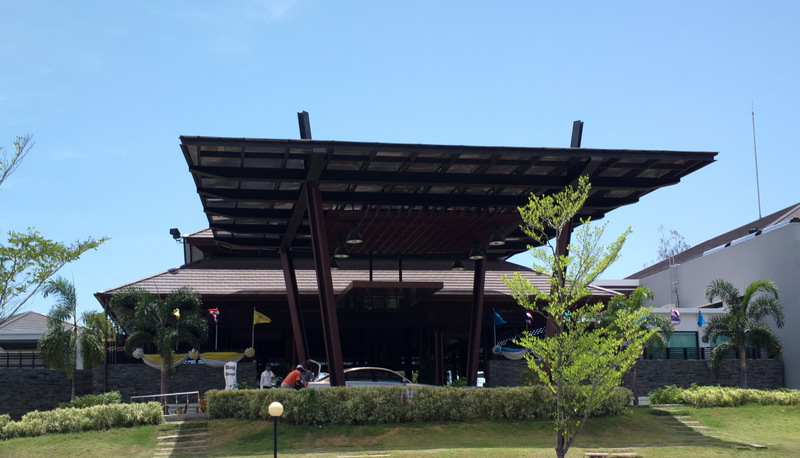 About 10 km north of Hua Hin in Cha Am, near the Dusit Resort, Palm Hills was designed by Max Wexler and opened to the public in 1991. Two distinct nine hole sections are separated by the beautiful clubhouse and an outcropping from the hills around which Palm Hills has been constructed. There is plenty of water on this course that winds around lakes and escarpments but not so that the average golfer should stock up on balls. Greens at Palm Hills can be Augusta fast and those who hit their pitch shots hard should be very careful. Earlier problems with the roughs on the front nine have all been solved and Palm Hills is once again a beautiful garden. The fairways are in good shape and have been widen. However, there are many new trees being planted on some fairways that will be giving even serious hitters a problem in a few years. Squash, badminton, and tennis courts, outdoor pool, fitness center, snooker room, sauna and children’s playground also available. Inquire about their annual resident memberships. This is a very popular course, probably due both to its beauty and its easily reached location midway between Cha Am and Hua Hin on Petchkasem Rd. 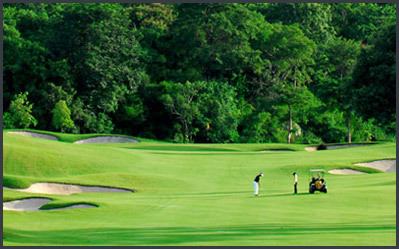 Designed by Jack Nicklaus, Springfield is considered to be one of the finest golf resorts in Thailand with amenities as good as anywhere in the world and a course designed to meet the demands of a recognized championship venue. It was the venue for the 2000 Thailand Open. With Michael van Amelsvoort as the resident professional, there are few courses with the professional services of Springfield. There are five tees for each hole but only the brave will dare the gold distance. This course will challenge the expert but not overwhelm one who does not play so regularly. With such a beautiful clubhouse and the Jack Nicklaus name, I was afraid of this course until I played it. While not easy–no course is easy when you don’t even rate a handicap!–this course is so beautiful and so well maintained, Springfield is a true pleasure to play. 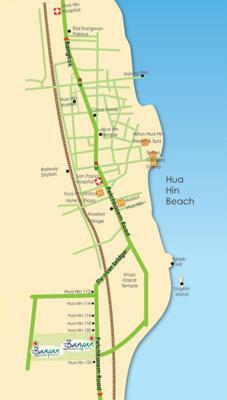 Near the Cha Am-Pranburi bypass, Lake View is easily accessible from Hua Hin, Cha Am and Bangkok. Designed by Roger Packard in an area originally knows for its pineapple production, Lake View has beautiful fairways often leading to hidden greens. Opened to the public in 1993, Lake View has thousands of palms and native trees on its undulating hills that make one wonder how it could have ever been a plantation–a credit to Packard’s ability. Lake View also offers a first class hotel with 75 rooms for those on a business holiday or wanting to get in more than a mere 18 holes each day. The hotel offers function rooms, Thai and international restaurants and tennis and squash courts. An ideal place for a day of golf or to schedule a seminar or retreat where work is not the only thing on the participants minds. Majestic Creek is as exciting as any in the area. With water hazards that will challenge the most adventurous, MCCC has many natural streams waiting for those who forget. Some of the holes here are very foreboding but the pleasure gained from walking through the beautiful environment will take some of the scare away. Whether it’s because Majestic Creek is further away from town than some courses or a lack of advertising, there are seldom crowds here so it’s ideal for those looking for a leisurely day of golf but forget to call ahead for tee-off times. The often small and hidden and very undulating greens and sometimes sadistic pin placement will bring you back to reality after the walk down the fairways though. The distance between many greens and tees can be quite long so a cart is necessary for many here. In fact, should you not get a cart, some of the caddies here can get downright surly. On this score, Majestic Creek could learn a lot from Palm Hills. A local Zoysia grass is used on both fairways and greens. This spongy grass provides incredible lies, as long as you stay in bounds, and using a native grass requires less water and chemicals than non-native varieties. Though located inland from the beach, the Majestic Creek also has a beach resort, located just north of the Royal Summer Palace in Hua Hin. The resort offers 48 rooms, each with a view of the Gulf of Thailand. There is a free shuttle running between the resort and country club throughout the day. 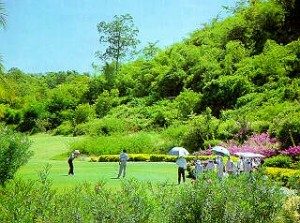 Cha Am Villa opened with 18 holes in 1992 and another 9 in 1993. The Sawang Resort is located in a private valley 3km off Petchkasem Rd just north of Petchburi. In Khao Yoi District, this retreat is great for a family getaway from Bangkok or a day trip from Hua Hin. There is a hotel with pool, health club and stables and a beautiful course for the golfer. There are also lodges built along the fairways that are quite reasonably priced. There is a lot of water at Sawang so bring some extra balls. The course is quite challenging but also provides opportunities for those who like to plan their game. The staff are very friendly and the greens and fairways are well maintained. Sawang offers package rates which combine rooms and unlimited golf and complementary breakfast. The Nichigo Resort is one of the most well known courses in Kanchanaburi, complete with its own 1/4 scale model of the River Kwai Bridge. This course is a serious challenge with ample use of traps and water. The front nine is known as the Lake Course and the second nice the Mountain Course. Long ball hitters must be accurate and those who don’t hit so long may not clear some of the traps, streams and other obstacles.